And so once again tomorrow is our Independence Day. It is when we celebrate our 55th year of political independence from colonial rule, as well as this profoundly unique feeling of freedom we’ve been taking for granted all that time up to now. And if one date should remain riveted in Samoa’s conscience it is 28 December 1929. On that day, now known as “Black Saturday,” the dream that Samoa would achieve independence from colonial rule was born; it was born in blood. 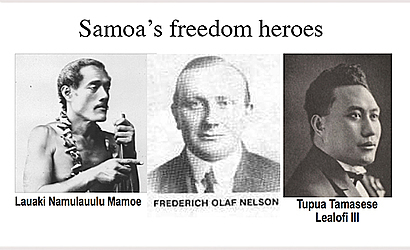 In the first months of 1909, Governor Solf called in the military to quash Lauaki and the Mau a Pule on Savai’i. Says Wikipedia: Nelson’s early years saw him working in his father’s business, and he became a successful merchant in his own right. Under German rule, when the country was called German Samoa (1900 - 1914), the colonial administrators treated Nelson as an equal. Nelson was excluded and alienated by the New Zealand government. Despite being elected to the Legislative Council in 1924, he could do little as he and the other elected members were constantly overruled by the more numerous government appointees. And so as we are approaching the celebrations of our 55th year of political independence, what do you think? Do you think we are honoring the memory of our forebears who sacrificed so much so that we can have this wonderful freedom to speak our minds that we are taking for granted today? Do you think our leaders are doing justice to the legacy laid down by those who suffered the indignity of being jailed and even died in exile, so that we could have this independence of thought we are enjoying today? Share your thoughts with the rest. It was first published in the Samoa Observer on 30 May 2013, now slightly revised.